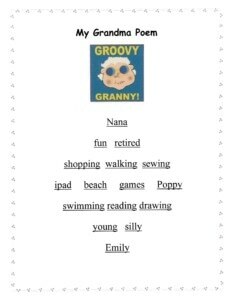 Easy to Create Fun Shape Grandparents’ Day Poems. Grandparents’ Day is always the Sunday after Labor Day. Grandchildren love creating gifts for their grandparents. They can have fun and learn some parts of speech as they create Grandparents’ Day poems. One easy, fun poem for grandchildren to write is the Diamond Poem. How to instructions are listed below with an example to help as a guide. You are welcome to download the printable Diamond Poem template for your children to use. What is a Diamond Poem? Also known as diamante—pronounced dee-uh-mahn-tay, was introduced by Iris Tiedt in A New Poetry Form: The Diamante (1969). To complete your Diamond Poem, follow these instructions. Optional: Place a picture of Grandma and Me over Groovy Granny!